these little guys have readied their cameras and they're waiting for blog camp to begin. and these little fellas are waiting to have a bit of fun too. are you ready for blog camp? 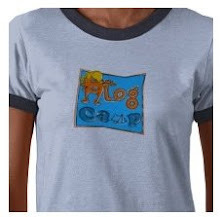 If I ever win the lottery, I'm going to Blog Camp. ah, have you and sabin been busy again? so cute - love the cameras and the fish! those are so cute Julie! Polly, new blog camp soon sounds good!